I love this chair, it gives an elegant touch to the room and is comfortable to sit on. My 10 year old and her friends love to sit in it and use it all the time for plays- an unexpected and fun bonus. Bring vintage-inspired glamour to your decor with this posh side chair by Safavieh. Featuring a dramatic seat back and luxe Bordeaux upholstery, this opulent chair makes a stunning addition to a formal living room. A cherry mahogany wood finish on the legs and a wingback silhouette complete the look of this piece, and a thick seat cushion provides plush comfort. 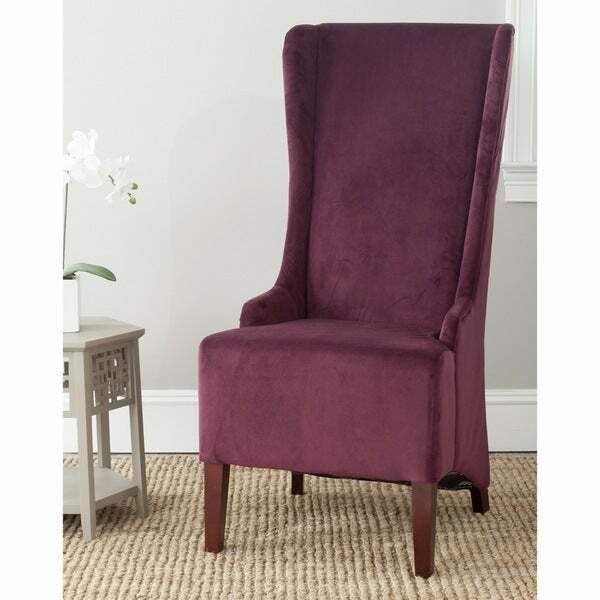 Lovely aubergine color on this Safavieh side chair. It has decent quality fabric and craftsmanship for the price. Chair back a bit rigid and seat comfort just okay. These are lovely chairs. I haven't had occasion to use them yet as I'm waiting for some painting to be completed. I plan to put them at either end of an antique table and chair set. The antique chairs will be along each side of the table. I think they will add some color and style to the room. Can't wait to get it all set up! Very pretty chair with a nice high back. I used two of them as captains chairs in my dining room. The color is just like the picture and they are very soft and comfy. great product. very nice, well made. went great with the theme and look of the room. would definitely buy this product again. recommend to others! I love my chairs , I use them as dining room chairs, my dining room looks so funky. And elegant at the same time. It’s a real WOW. These chairs are absolutely Exquisite while they may be dining room chairs I placed them in my wine room for a perfect pairing with my cream sofa. Love these chairs. Very comfy and great color to compliment the wall color in the opposite room. Classy and elegant. Speedy delivery. Love the style and the color! "I'm sorry, I don't drink. So that didn't help me, unfortunately. If you would answer my question exactly the way I asked it, it would be so much more clear for me. Again, does this chair lean more toward the red or the purple side of Bordeaux? This is important because there are warmer/redder wine colors (i.e., Bordeaux, maroon, burgundy...) and there are cooler/purpler ones. Because of what you said about the monitor, that is why I need an actual visual verification of this. I explained I had seen a color difference in two different pictures of the same item while on the same monitor. So never mind monitors, pictures can be off, too. So it is very unclear to me what I am buying. Might I suggest taking someone with you to get a consensus? An older woman, perhaps, would be an excellent choice due to the experience she has with these types of purchases. Many thanks in advance for your trouble." Hello Vulffy, we certainly understand. But, color is very subjective and if you ask five different people what color the Safavieh Deco Becall Bordeaux Side Chair is, you will get five different answers. It's a beautiful chair and a beautiful color of Bordeaux, The color of a Bordeaux wine, is a dark red, almost bordering on the color purple. in our opinion. We hope this helps you a little more, please enjoy your day. "Does this color lean more to the purple or more to the red? I have seen pictures where it looks both ways. Thanks!" Hello Vulffy, the Safavieh Deco Becall Bordeaux Side Chair leans more toward a perfect Bordeaux, think of a fine Bordeaux wine. Please remember, due to the difference of monitor colors, the colors on some of our items may vary slightly. We try to represent all colors accurately. Have a great day. "Hello, Gorgeous chair! Just two questions please. What color is Bordeaux? Burgundy, guessing. :) Also, is the fabric cotton velvet? It looks soft like velvet or microfiber. Thanks so much!" Hello thepersonalshopper, we appreciate your inquiry. Yes, the color is maroon, and the upholstery is a microfiber material. We hope you have found this information helpful. Thank you for shopping with us. Have great day!